Aravade is a remote village, in the district of Sangli, which is about 450 km east of Mumbai (Bombay), with a population of around three thousand. Sangli enjoys a central and strategic location in Southern Maharashtra and is linked to most parts of Maharashtra by road and railways. Aravade is the birth place of H.H. Lokanath Swami Maharaja and is a holy location for his followers. H.H. Lokanath Swami Maharaja is one of the senior disciples of A.C.Bhaktivendanta Swami Srila Prabhupada, who is the founder of International Society for Krishna Consciousness. 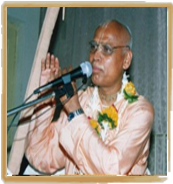 Srila Prabhupada had instructed his dear disciple Lokanath Swami to disseminate the Holy Name of Krishna by carrying out padayatras through the villages. Since then, he has tried to fulfill this instruction of his spiritual master to the fullest.With guidance and inspiration of Srila Lokanath Swami, the Hare Krishna festival is celebrated every year for over 25 years. Approximately 10,000 people from surrounding villages to attend this festival. 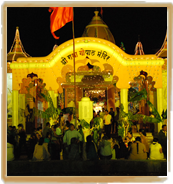 Given that this place has become well-known, ISKCON resolved to establish the Hare Krishna Gram in Aravade. Please accept my most humble obeisances at your feet. His Divine Grace Srila Prabhupada has received your two letters both dated 25th July, 1977 and thanks you for them. Because His Divine Grace is not keeping good health, He has instructed me to reply you as follows. Srila Prabhupada was very very pleased with your report of your preaching activities. When He heard how strongly you were preaching, He commented, “Our Lokanath Swami is just like Saint Tukaram. The whole of India and specifically your Maharashtra are enthused with Krishna. Now you have to revive their Krishna consciousness. This is Tukaram’s country, but now they are becoming bad politicians. So revive them by the process of the sankirtana movement. I am very glad that you are preaching village to village and will cover all of Maharashtra. You should train the one farmer from your native village so that he can actually become an ISKCON representative there. 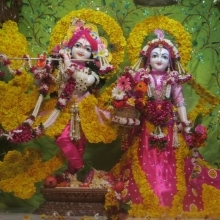 The beautiful and attractive deities of Sri Sri Radha Gopal preside in this temple. A grand hall decorated with pastimes of Lord Krishna has been created in front of the Garbh-gruh. It boasts a combination of modern and ancient architecture and Vastusastra. From a distance one can observe the tall outstanding domes of the temple. The sprawling Vrindavan Garden enhances the beauty of the temple premises. The Krishna Tattva Darshan is set to enliven all visitors, especially the school children who are generally spell bound by the effervescent beauty of the deities, Sri Sri Radha Gopal. The father of the Indian Nation Mahatma Gandhi used to say, ‘Go to the villages. With the developments of villages real development and unity of the country can be achieved’. The majority of Indian population lives in villages. The village people are allured by so called modernization and urbanization and are becoming neglectful of our civilization. They have begun to migrate in their millions to experience the dazzling city life in the hope of becoming wealth. There is therefore an urgent need to protect our culture and civilization from aftermaths of so called modernization. The Hare Krishna Gram Project aims at distributing Krishna’s holy name, rejuvenating of Vedic civilization and making the lives of people more meaningful. 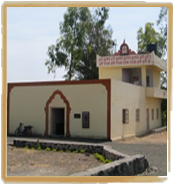 The motto, “Simple living high thinking”, which is the fundamental principle of spiritual life is a critical vision of this project.The main objective of Hare Krishna Gram Project is to establish the basic principle of spiritual life “Simple living High Thinking” and thus protect the villagers from degeneration. This is especially important for the youth who are forgetting their Vedic culture and are totally ignorant of how importance village life is for spiritual advancement. This is a unique project through which people from 100 villages, students from more that 350 schools and colleges as well as residents of Sangli city will highly benefit. Please join us in this endeavor. This is a humble request to all!